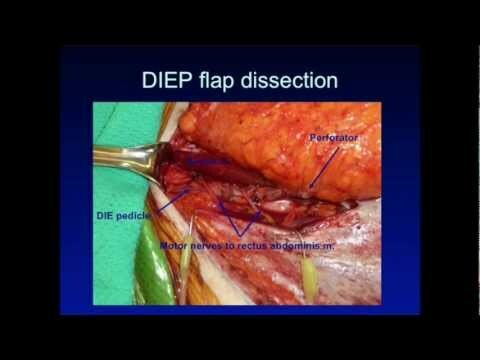 One of the most exciting new advances in breast cancer reconstruction following a mastectomy is the use of Perforator Flaps, such as the DIEP (Deep Inferior Epigastric Perforator) Flap. The DIEP is the most common and original of such procedures. This procedure involves using the patient’s own tissues, from various parts of the body, to create a new breast. The techniques involved require microsurgical training and are therefore, only done by a relatively small number of plastic surgeons around the country like Dr. Duffy and Dr. McKane in Dallas. Not every patient is a candidate for a DIEP Flap, and each patient should consider all the available options before making a decision about breast reconstruction. "I just wanted to say "Hello" to Dr. Duffy & tell him that he changed my life! Also, I want to not only say "thank you ALL for your compassion & support as I was going through the most difficult times in my life. I will never forget you all! God bless each & every one of you!" "Dr. McKane did an excellent job helping me get through my breast reconstruction. It was a very difficult period emotionally for me after I lost my breasts. He took a lot of time with me and really cared for me. He always listened to me. My reconstruction was done using DIEP flaps. He restored my breasts and a lot of my confidence. I look great and I highly recommend him. His staff is wonderful too." The DIEP Flap involves using tissue from the abdomen as is done with a TRAM flap. However, with a DIEP flap, the abdominal muscles of the abdomen are left intact. The blood vessels needed to keep the flap alive are microsurgically dissected by the surgeon through the abdominal muscle, enabling the surgeon to use the overlying tissue without removing the abdominal muscle. The DIEP flap utilizes the same tissues but involve somewhat different blood vessels. The determination as to which of these two flap types to use is made by the surgeon, often at the time of the surgery itself, and is based upon the best available vessels in a particular patient’s anatomy. Dallas breast cancer reconstruction patients have the same long scar across the abdomen as those who have a TRAM flap and generally have an improvement in abdominal contour. However, patients typically experience fewer complications due to muscle loss and have quicker recuperation periods than patients with TRAM flaps. The Texas Center for Breast Reconstruction has the first surgeon to perform this procedure in this part of the state. Currently, Dr. Duffy and Dr. McKane are among only a handful of surgeons in this part of the country regularly performing DIEP perforator flap procedures. We are very excited to be able to offer this option to patients. The SGAP (Superior Gluteal Artery Perforator) and related IGAP flaps involve using tissue from the buttocks region to create the new breast. The same microsurgical technique is utilized as with the DIEP/SIEA. For patients who are unable to have a DIEP/SIEA, perhaps because of a prior abdominal surgery or because there is not sufficient abdominal tissue, the SGAP may be an option. The TUG (Transverse Upper Gracilis) Flap and the related VUG or FDL Flap involve using the tissue from the inner thigh to create the new breast. This involves the same microsurgical technique as in the DIEP flaps but is an option for those who cannot use the abdominal tissue due to prior surgeries or insufficient tissue. The PAP (Profunda Artery Perforator) Flap is yet another type of microsurgical flap like that of the DIEP except that it involves using tissue from the back of the thigh, beneath the buttock crease. It represents yet another option for those with insufficient abdominal tissue or prior abdominal surgeries. Since the reconstruction involves using the patient’s own tissues, the risks of implant reconstruction are avoided. Because the abdominal muscle is not removed, patients have less risk of developing hernias at the site where the flap is removed than patients who have had a TRAM flap. It is typically easier to match the contralateral natural breast with the patient’s own tissue when compared with implant reconstruction. Patients essentially end up with an improved abdominal contour at the same time as the breast reconstruction. DIEP flap reconstruction generally requires a longer and more difficult surgery, at the first stage when compared with implants or TRAM flaps. Patients will have a scar across the lower abdomen where the flap is obtained. Our goal for our patients after cancer is to get them completely well and that includes physically, emotionally, and psychologically. Breast reconstruction with flaps is an excellent procedure in accomplishing this goal and we take it very seriously. We understand that all patients are different and require a different treatment approach. When you contact our office to schedule a consultation, our team works closely with you to learn all about you to provide exactly what you need in terms of breast reconstruction. Please contact our office immediately to set up a consultation.